On 8 September 1847, Joel Tillman Harless, along with his wife, Sarah, sold 80 acres of land in two parcels to Benjamin R. Harris and his wife, Caroline. Unfortunately for Benjamin, the deed was written incorrectly and he needed to have it corrected. 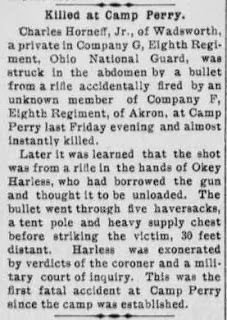 I do not know when he first noticed the error, but by the time he got around to getting it put right, Joel T. Harless had died. Benjamin’s misfortune is our good fortune, because now he had to bring suit against the heirs of Joel T. Harless and his own children (as the error in the deed had made the property over to them). On 6 November 1854, Benjamin R. Harris and his wife, Caroline A. E. Harris (nee Vann), brought a bill of complaint against: Thomas Harless, John W. Harless, Charles Harless, Tib Allison, and his wife, Matilda, formerly Matilda Harless, Thomas Harris, Martha S. Harris, Nancy Harris, and Rosaline Harris [the 4 children of Benjamin and Caroline], of the county of Madison, State of Alabama, Andrew J. Middleton and his wife Rebecca, formerly Rebecca Harless, of the county of Jackson in said state, Sarah S. Harless of the county of Marshall in said state, and David Harless of the county of Marengo in said state. The heirs at law listed for Joel Tillman Harless are his siblings and, as mentioned, his widow. In my records, I have that Sarah gave birth to a posthumous daughter of Joel and remarried a year or so later. BUT a posthumous child would have been entitled, under common law and the laws of Alabama, to a share of the estate (if they lived) and would have would have disinherited the siblings of Joel Tillman Harless. Eldrid Harless is listed in the 1850 Census in the household of Sarah and her second husband, Willis Kirkland, showing that if he was the son of Joel he had indeed survived and would be the lawful heir. Unfortunately for us there is nothing in this chancery case to show whether or not Benjamin R. Harris was mistaken in his listing of heirs. Died: before 14 August 1851. Parents: John Harless and Catherine Moser. Known Children: Milly Ann Harless. The newspaper headline was tantalizing – “Twists of Fate. Man Slew Ex-husband First Wife; Slain Himself” and the article didn’t disappoint, but it left me confused. The first time Charlie C. Graham, 45, married a divorcee, he killed her former husband. He went to prison on a life sentence, but was paroled and married another divorcee. Friday night the second husband killed Graham. Eleven years ago Graham walked up to the automobile in which Glenn Harless was seated and shot Harless after an argument. Friday night Graham walked up to the automobile where J.B. Rylant, 45, was seated, got into an argument, and Rylant killed him. They had been friends since boyhood. Coroner __ M. Evans reconstructed the shooting today, and ordered Rylant held under $2,500 bond in a murder charge. I was unsure who had married whom and when. All I really knew was that Charlie seemed to argue a lot and he was killed in circumstances very similar to those in which he had killed Glenn Harless. This is what I found out. The murdered Glenn Harless was, in fact, Glen George Harless, son of Benjamin Franklin Harless and Sarah Fannie Leonard. Glen was born in Calera, Shelby County, Alabama on 28 November 1890. On 13 June 1915, he married Cory May Smith, it would prove to be his undoing. 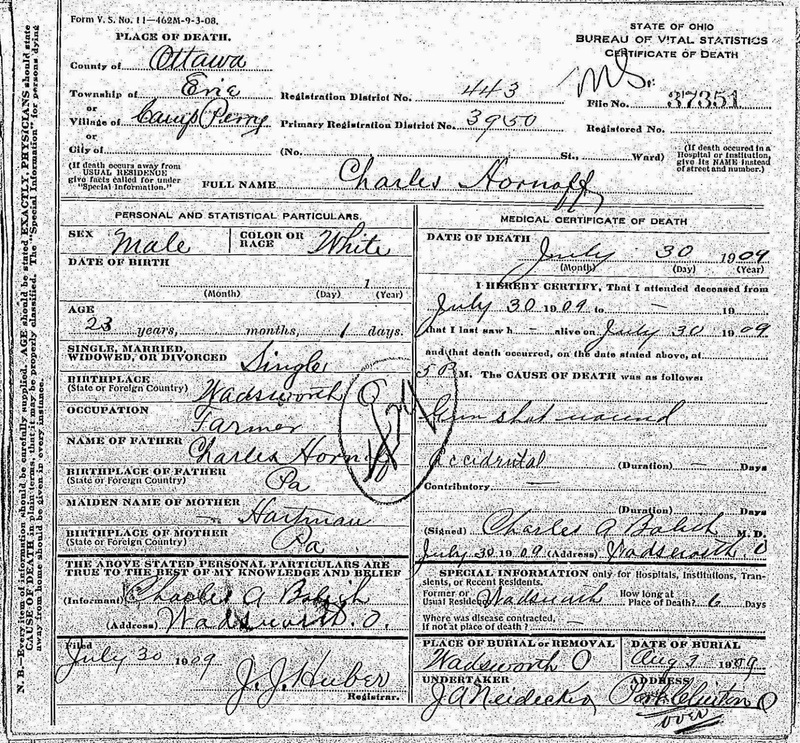 The marriage lasted until at least 1920, but on 31 May 1928, Cora married Charles Crisp Graham in Blount County, Alabama. Her name is given in the record as “Miss” Cora May Harliss, but the newspaper article calls her a divorcee. I wonder if Charles was aware of this prior to the marriage, but he certainly knew it afterwards. Just five months after the marriage, Charles Crisp Graham shot and killed Glenn George Harless. 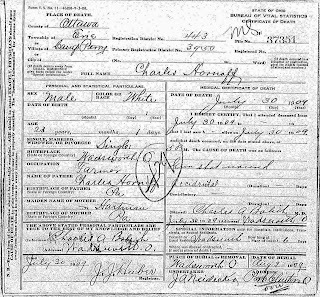 Charles was sentenced to a life term and he can be found in the 1930 Census in Kilby Prison. I do not know when he was released. In 1934 Cora and Charles were divorced and on 23 December 1938 Charles married Bessie L. Haley in Anniston, Calhoun County, Alabama. Bessie had been married twice previously. Her latest marriage, to J. B. Rylant had ended in divorce in 1938. On 20 January 1939, Rylant killed Charles Crisp Graham in Birmingham, Alabama. I do not know what happened to Cora or Bessie, or even Rylant, but Glen George Harless did not appear to have had any children with Cora. Parents: Benjamin Franklin Harless and Sarah Fannie Leonard. Relationship to Johan Philip Harless: 3rd great-grandson. William Warren Harless was a natural athlete and handsome with it. Born on 9 March 1867 in Chigago, Illinois to Thomas Henry and Barbara Ann King Harless, he was the youngest of 8 children (2 older half-siblings had died as children almost 20 years before William was born). William Warren was only 3 years old when his father died, but his mother was well provided for and was able to raise her children by herself until she chose to remarry when William was 11 years old. William Warren Harless began his higher education at Notre Dame but transferred to the University of Michigan because Notre Dame did not play football. 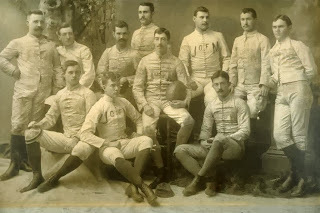 For the 1886 season William was a substitute player, but was a rusher for the 1887 season and was invited, with his teammate, George Dehaven, back to Notre Dame for a training session to teach the Fighting Irish this new game. Perhaps William was a better player than a teacher, but when Notre Dame played their first ever game, against Michigan, they were defeated 8-0 and it would be 32 years before the Fighting Irish would achieve victory over the Wolverines. William played football as a center, a rusher and a guard, but this was not the only sport he participated in. In 1887, he came first in putting shot (29′ 3″), and the hammer throw (56′ 10 7/8″), but was defeated by W. C. Malley in heavy weight wrestling. 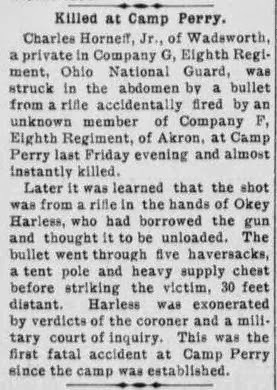 It was noted that both the hammer and the shot were overweight and that otherwise the distances might have been greater. The prizes were of interest too, a set of George Elliot’s works for the hammer throw and Paradise Lost for the hammer throw. After university William Warren Harless became a civil engineer and married Mary Jane Lennon in 1896. William and Mary had no children, and when the Spanish-American war broke out, William joined the US Army as a quartermaster in the 7th Illinois Infantry. 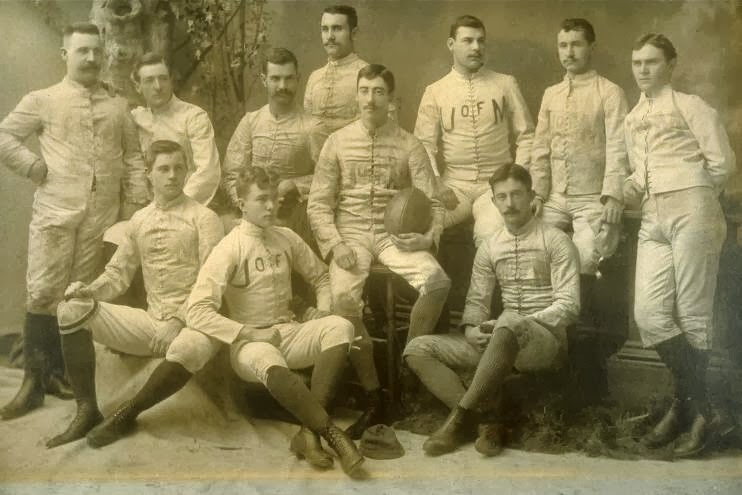 Following his stint in the army, William became the manager of an insurance company, but his love of sports had obviously not left him, as he served as the Secretary of the West Golf Association for a number of terms. Parents: Thomas Henry Harless and Barbara Ann King.